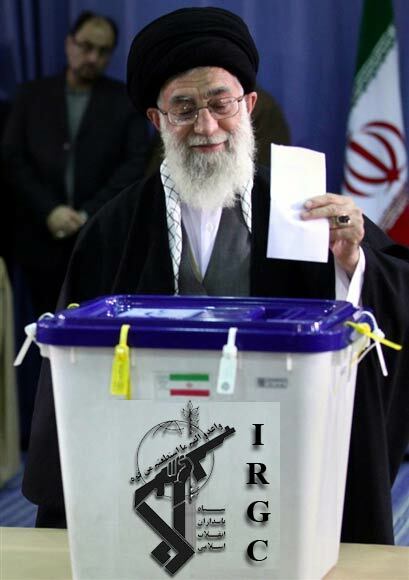 Two days after a senior Revolutionary Guards (IRGC) official made direct remarks about this military organization's plans to control Iran's upcoming presidential election in June, ayatollah Khamenei representative in the same force also spoke of the responsibility of the Guards to "rationally and logically engineer the elections. Khamenei's representative in the force cleric Ali Saeedi had earlier also said that the IRGC "was not indifferent over who became president." Even though Saeedi's latest remarks were refuted by general Ramezan Sharif, the public relations official of the Guards who said what he meant was "the logical and rational engineering work concerning elections" meaning "activating the potentials of the force in implementing its legal mission and responsibilities in the field of elections." In a lengthy talk with Iran's ISNA student news agency, cleric Saeedi described the posture and plans of the IRGC regarding the upcoming elections while also listing how the force was going to implement its "responsibility." In the interview, ayatollah Khamenei's representative boasted about the Guards' interventions in various elections by saying, "As the person who is the representative of the supreme leader in the Guards announce that our guardsmen have reason and logic and so we only raise the ideals and standards." He then claimed that the Guards never got involved in the content of the elections and that it only explained the framework and criteria which does not translate into intervention in election adding that their inherent nature was to "rationally and logically engineer the elections." Saeedi said the claims that the Guards interfered in the elections has no evidence. He said the force was an institution above political parties and organizations and does not invest itself in any party or person. He responded to the complaints of some principlist Majlis representatives such as Ali Motahari who had accused the IRGC of interfering in the last presidential election in 2009 by saying, "Inside the country too some individuals are pursuing the policy of Guard mongering. These individuals view the IRGC as an obstacle to their [personal] ambitions. During (president) Bani-Sadr's time and the reformist era too this issue existed. Some attributed the mistakes of a person or parts of the Guards to the whole IRGC. We do not expect those from within the principlist camp to pursue the mistakes of others for example extending the mistake of a news agency to the whole organization." As a student of conservative cleric Mesbah Yazdi, Saeedi used the words "engineering" rather than "interference in the elections" and said, "Some do not accept the notion of 'election engineering' and claim that the IRGC has actually interfered in elections. That there are influential individuals among the public who are influential does not impact the elections. This claim of rigged election too has its roots in the sedition of 2009." Saeedi called the IRGC to be the "center" of the regime. In his talk, he added a few more qualifications needed to be a presidential candidate, to those already expressly defined in law and the constitution. "Anyone who wishes to be a presidential candidate must have three characteristics: accept the remarks of the supreme leader as final and not challenge them; possess management authority; and, possess values." Ayatollah Khamenei's representative also responded to the remarks that Asqar Owladi, the secretary general of the Jebhe Peyrove Khate Imam va Rahbari (the Alliance of the Followers of Imam's and the Leader's Path) recently made to the effect that Mir-Hossein Mousavi and Mehdi Karoubi were not seditionists - as is the official view of supporters of supreme leader ayatollah Khamenei - and said, "During the 2009 sedition people's position were very clear. Mousavi and Karoubi did not accept the results of the 2009 election and turned the opportunity that had rise for the regime into a threat. They confronted the regime. How can they not be seditionists? What are some of these gentlemen saying?" Mousavi and Karoubi continue to be under house arrest for their questioning of the way 2009 presidential elections were held and their officially announced results, which brought Mahmoud Ahmadinejad a second presidential term to end by June 2013. The arrest of these two veteran politicians has split the body politic of the Islamic regime with those ardently supporting ayatollah Khamenei calling them seditionists who have fallen out of the path of the revolution, while others such as Rafsanjani give credit to some of their view and call for a different more inclusive approach to the issue. The IRGC along with Ahmadinejad have been accused of engineering the 2009 election by reformers and some other senior politicians as well. Hardline Iranian cleric calls "free elections" code for "sedition"